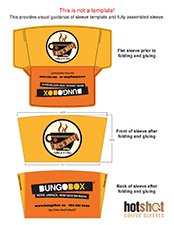 Below you find coffee sleeves templates for both our PREMIUM and STARDARD cup sleeves. We have included both Illustrator and editable PDF templates (within ZIP file), but we prefer if you can work with the Illustrator file whenever possible. All orders include some FREE design layout time! If you do not have the software, time or graphics know how to put together your cup sleeve then do not worry! All orders include some basic layout time at NO EXTRA COST. 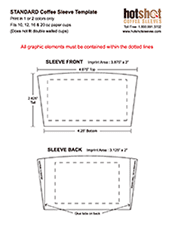 If you would like us to prepare your custom cup sleeve please read more about what is required here. Download this template if you are printing sleeves in 1 or 2 colors and you DO NOT require background printing or printing right to the edge of the sleeve. Find out more about STANDARD sleeves here. Download this template if you are printing sleeves with more than 2 colors and/or you are printing with bleeds or background colors. Find out more about PREMIUM sleeves here.